If you are looking for a game that will see the cold winter nights diminish and transport you to sunnier climes, then you need to head to your favourite Microgaming Casino and check out the fabulous new 243-ways to win 5×3 reel slot, Bikini Party. As the name suggests, the theme of this slot is a gaggle of Bikini-clad girls, all of whom just happen to be beach volleyball players. As you would expect from such a theme, this means that the slot is bright, colourful and cheerful, the ideal contrast to the cold winter evenings. Not to mention that with a minimum bet level of just 0.25 per spin, you can easily afford to see these gorgeous girls in action, flaunting their skills and much more on the beach volleyball court. Each of the five girls is one of the in game high symbols with the usual playing card symbols acting as the lows. However, what really makes the base game very different to any other slot is the incredible new Reel Respins feature. After a spin, you can then, for a varying number of credits, elect to spin one of the reels individually. You can choose any reel, but the cost for spinning each one may be different. You can respin the reel as often as you care to in order to try and trigger a big win, land free spins or you want to quit and spin all the reels again. Speaking of free spins, landing three or more of the Volleyball scatter symbols will earn you a free spins bonus, which sees 15 free spins complete with a 3x multiplier paid on all wins. You can retrigger free spins from within the free spins round too. During the base game, the Bikini Party logo acts as the in game wild, substituting for all high and low symbols to give you a greater chance of landing a winning payline. 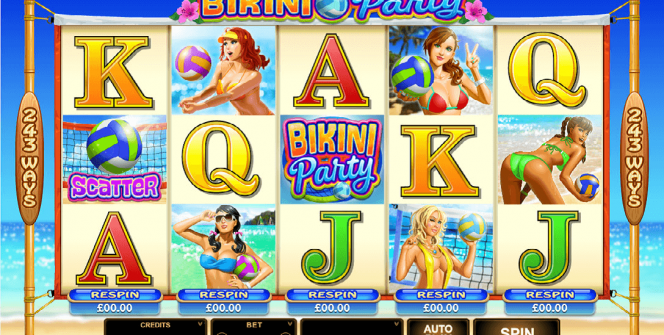 With gorgeous graphics, a fantastic soundtrack, five beautiful bikini-clad babes and a jackpot of up to 120,000 coins to be won, Bikini Party is well worth having a few spins on in 2016.